After the amazing results of the Age group gymnasts 12-18 this morning in the Lotto Arena, it's showtime for the gymnasts Age 13-19 this afternoon. The 13-19 finals were launched by the Women’s Pair event again. The first performer on the floor was the French pair. Their emotional performance included some solid balance combinations. The girls scored 27.000 and finished the competition in the 6th position. This bronze medal for Australia, won this morning by the 12-18 Women’s Pair, was the country’s first medal in a WAGC event since 2002 and kept them hungry for more. The pair made small mistakes and finally scored 26.400 which put them in the 8th position, but it was a great performance and they’ve received fantastic support from the Aussie fans. The competition for the top places was intense. Great Britain’s Stamatia and Stephanie who won the qualifiers yesterday scored an amazing 28.350 and just as no one thought that someone can threaten their lead Israel’s show (quite literally as their performed to Show must go on) pushed the British pair to the silver position. Israel has been awarded the lowest difficulty score of all pairs competing in this final (1.21), however their fantastic artistry score (9.150) and clean execution, put them in the lead with only 0.01 advantage of the UK! Another fantastic surprise happened in the bronze position today. The US pair who yesterday qualified from the 8th position, really outdid themselves today and won another bronze medal for team USA today! 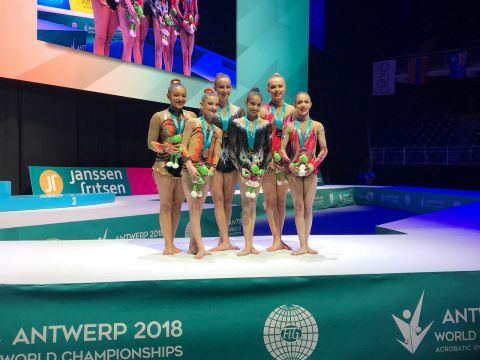 Russia who qualified from the 6th position, once again amazed the audience with their balance combination in a side splits which got them a massive round of applause finishing 4th 0.1 behind the podium. This is the first final today where Russia did not win a medal. In the Men's Group competition there weren’t any surprises. Russia scored an amazing 28.550 and finished first. Kazakhstan came second with 27.250 and Ukraine finished 3rd. Unfortunately according to the FIG rules If there are less than 4 countries participating in a category, no medals will be awarded. Certificates of participation will be presented. The groups fought well and presented some thrilling skills therefore to celebrate their talent and success, instead of the medal ceremony they participated in a Celebration Ceremony where they’ve been presented with the competition’s mascot, Gymba. The final round didn’t change anything in the 13-19 Mixed Pair competition lead. Kazakhstan, who was 1st in the qualifiers, was the most awaited performance of the this final. Unexpectedly, both Kazakhstan and Great Britain performed to the same song - Christina Aguilera’s Hurt. In their passionate performance the Kazakh team confidently landed their tempo elements and strongly finished their routine with impressive one arm balance of side splits hold. 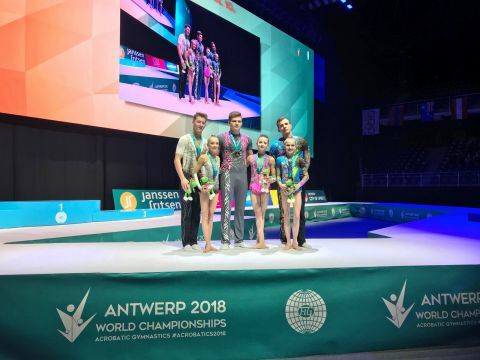 They scored extraordinary 29.250 which was the new highest score of this edition of this WAGC and put them in the lead with 0.68 difference to the silver Russia and over a 1.0 over Great Britain. The British Pair scored 28.200 with the highest artistry score in this final event (9.200) adding yet another medal to the country’s superb medal total today. Men’s Pairs competition was a true feast for the eyes and ears. Cheerful music medleys were definitely the leading tune of this final, opened by the Portuguese pair who showed off their moves in a vibrant routine. The combined exercise put them in the 4th position by 0.2 UK’s pair Finlay and Frazer. That was the closest difference in this final, as between all partnerships in the podium places there were impressive advantages. 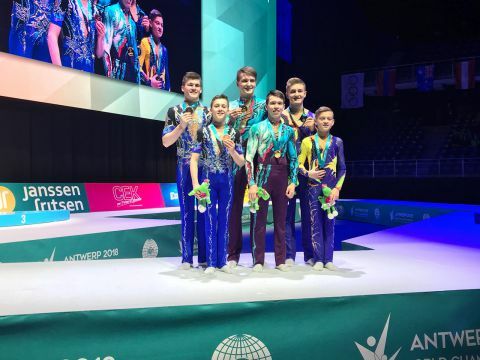 Silver medallist of the European Age Group competition, Great Britain, danced their way on the podium in the rhythm of the Jailhouse Rock and got the whole house clapping. The boys scored a solid score of 27.500. The Belarussian boys also showed of some quality dance moves and presented a lengthy head balance combination, steadily held while sitting down and standing back up. They scored a full point over the UK’s result and finished in the silver position with 28.500. Russia’s performance was truly something else. After series of light, amusing medleys the Russian duo presented a powerful routine. Mighty finish to this rock’n’roll filled final was an absolute crème de la crème of today. The Artem and Andrei scored a massive 29.400, again raising the bar of the highest score awarded during this WAGC. They’ve shown an amazing potential and we can’t wait to see more of them in the future. 5th and 6th respectively Ukraine and USA finished with solid mid-26.000 scores. The USA pair, who were 11-16 bronze medallists from Putian did strong routine to another medley including: Walk this way and Tequila. Already in the qualifiers they were recognized as a pair of great entertainers and although they finished in the 6th position, their performances will not be forgotten. Finally the Women’s Group competition was a true example what gymnastics is all about. Elegance, strength and a bound with your partners – in this final we’ve witnessed it all. There were no weak teams in this final – everyone who performed truly deserve to be there. Russia’s opening women’s group made a mistake in their balance combination which cost them a penalty of 1.9 and they finished the final round in the 8th position. USA finished 7th and Ukraine 6th. Belarus, whose balance combinations were remarkable, finished 5th. Until the last routine of the day Great Britain stayed in the 3rd position. 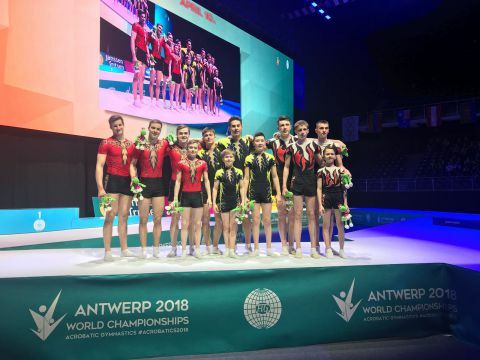 However Belgium’s fabulous routine and fantastic score of 28.600 pushed them off the podium winning the Belgian trio a well-deserved silver medal, first one for Belgium in this WAGC. Israel’s routine launched with a very creative opening pose, once again awarded with a high mark for Artistry (9.250) scored 28.450 and finally put them in the 3rd position. The winner took it all. 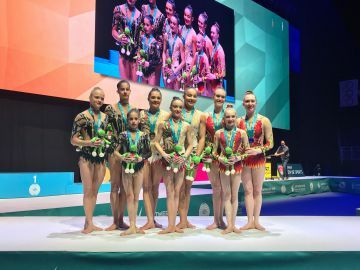 The winner of the 13-19 Women’s Group finals was Portugal, who qualified from the 1st position, as their qualifying score was a total of 57.000 (which was also the highest qualifying score across all categories). Today they to this amazing result they added another splenidid score of 29.050 and won the first gold for Portugal which was enthusiastically (that doesn’t even begin to cover it) received by the Portuguese crowd. Well done to all gymnasts and coaches. Thank you for your amazing performances and we hope you are very proud of yourselves, because are extremely proud of you!